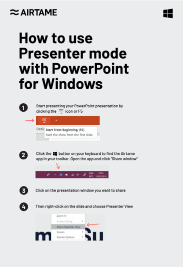 🎯 Presenter mode works with PowerPoint and Google Slides on Windows and Mac computers. 🎯 If you are a macOS user, you can also use AirPlay for presenter mode. 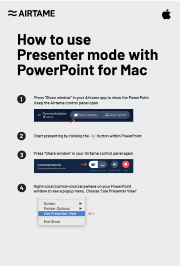 🎯 At the bottom of the page, find printable "How to use presenter mode" posters which can be hung in your meeting rooms or classrooms where Airtame is used. ☝ To share to additional Airtame-equipped displays, simply open the app and click "+ Add screen" next to the name of the desired Airtame display(s). Open your PowerPoint presentation and select "Start From Beginning". 2. Open the app and click “Share window”. ☝ If you are on Windows, to access your toolbar and find the Airtame app, first click the "Windows" button on your computer keyboard. 3. Back in PowerPoint, click on the presentation window you want to share. 4. 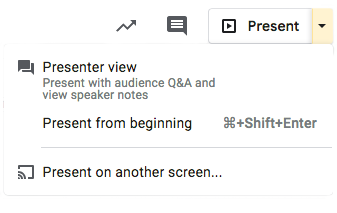 Right-click on the slide and select "Show Presenter View". 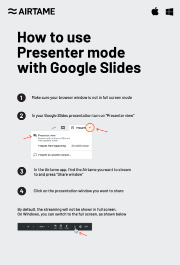 In your Google Slides presentation, select “Presenter view”. By default, the streaming will not be shown in full screen. You can find all the instructional posters here.